Composting is a natural process of recycling organic materials into a rich soil known as compost. During the process microorganisms break down organic matter, like feces, into safe topsoil that can be used in gardens to grow food. 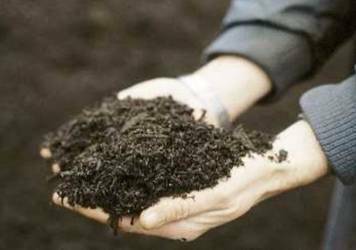 The compost has a pleasant smell and can be safely handled without fear of contamination. With Eco-San toilets, about a cup of wood-ash is added to the compost after each use. (Most households in Kovalam cook over wood fires, so there is a ready supply.) Ash reduces acidity and speeds up the composting process. The ash also covers the feces, helping eliminate odors. Dry leaves or grass can also be added to the mix. Given an occasional stir with a long pole, the feces partially composts--even as the toilet is being used. After about 6 months of use one vault will be filled to capacity. It is then 'sealed' and the second vault used for the following 6 months. By the time the first vault is re-opened and the compost removed, all pathogens will have been destroyed. The compost can then be safely removed by hand and used around flowers, plants or trees. Note: Complete composting in warm tropical conditions takes about 9 months. Our design calls for about 6 months of partial composting as the toilet is being used, followed by 6 months of "non-use," a total of 12 months.